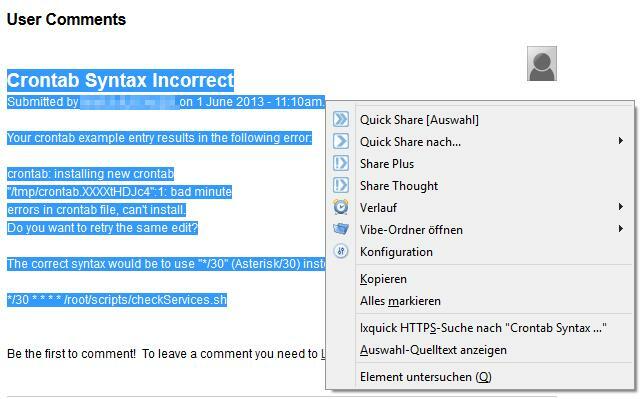 Let us share with you some possibilities of how to use ShareOnVibe together with your Micro Focus (former Novell) Vibe platform. You might find use cases you’ve never thought of before and which can make your (work) life a lot easier. If you found a way to apply ShareOnVibe that you think should be included in this list, please feel free to send us a message. Thank you! 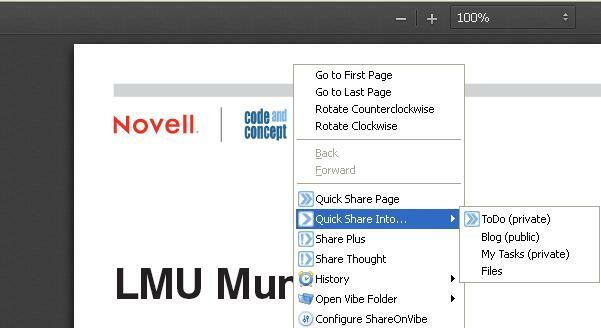 In order to share text from your browser into Vibe, select the section to be shared with the mouse and right-click on it. Choose the target folder to share into and with one click the text will be saved in an entry in the target folder. This simple process is especially useful for collecting snippets and the sites they came from when you are crawling the web for specific information. Instead of several copy and pastes to save e.g. a citation including author and source, you just select the paragraph you might need and share it into your collection target, e.g. a project folder of the “blog” type. Once the text is successfully shared with Vibe, you’ll get a a confirmation of the share with a direct link to the newly created entry. 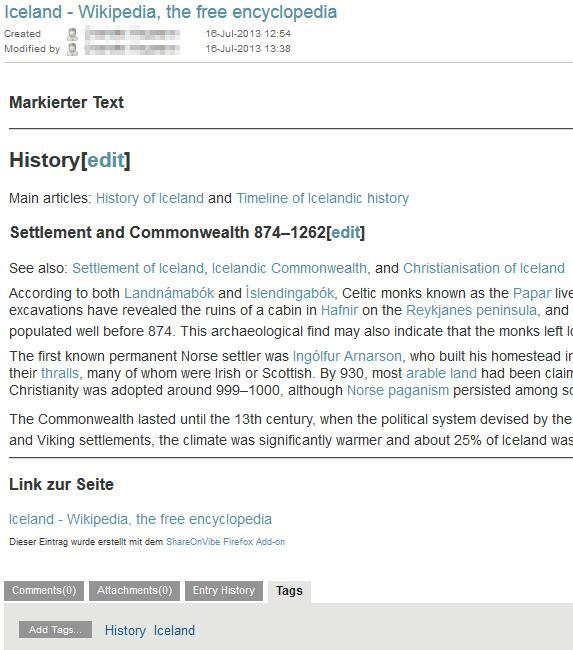 In your target folder, the selected text is displayed together with the title of the website and a link to the website the text originates from. This way, your project partners can easily access your input and consult the original source. Even migrating text from presentations, word processing files, spreadsheets or PDFs could not be easier than with ShareOnVibe – simply upload or share the file into Vibe, view the file as html and use ShareOnVibe to share it into your Vibe folder. Sometimes you don’t want to share a specific paragraph but you want to keep an eye on an interesting website, e.g. because it will offer you some interesting information in the future. Use ShareOnVibe to bookmark this website! Just right-click somewhere on the page and choose your target folder to save the link, title and description of the website in order to find it again at a later time or to share it with your co-workers. An entry with the title of the page, its description and a link will be created in your target folder in Vibe. Stop searching for that one website with the latest information that you bookmarked on your home computer – find the link shared with ShareOnVibe in your Vibe folder. 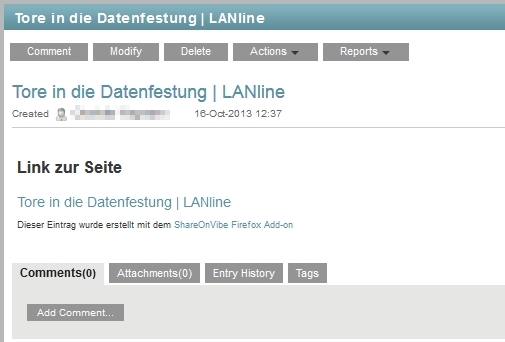 Do you want to attach the article easily to an entry in Vibe? Right-click on the link to the file and choose a target folder. The information about the article (title, link, comment) will be saved in Vibe as an entry in the target folder and the shared file will be attached to the entry. That saves you the hassle of downloading the file, opening Vibe and uploading the file again – ShareOnVibe does that for you! 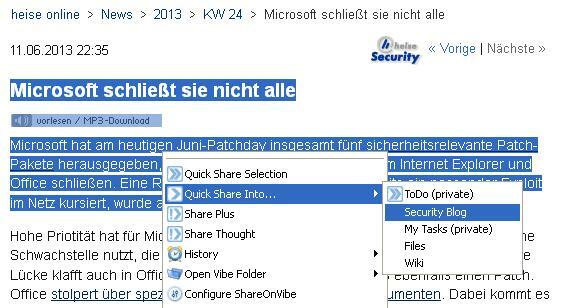 Would you like to share only a link to an article or certain text passages without uploading the file itself? If you are using a browser with PDF reader (many current browser version do this), simply open the link in your browser. When you right-click on the article or marked text to share it, the document will be handled like a normal webpage which means the link to the article will be saved in an entry in your target folder, without the file attached. If you upload your files directly into one file folder, you can work with them and build up your very own library. And if you need further information on your sources – just use the link. With ShareOnVibe, you can easily and simply share a “Post-it” via the Share Thought function! 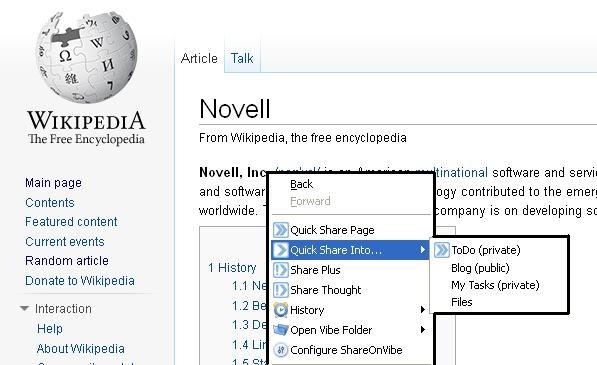 Enter a title, a text, tag it right away, and share it into Micro Focus (former Novell) Vibe™ – making the information permanent, searchable, and – if you use a private folder – safe from prying eyes! Keep your sticky notes in Vibe instead of on your desk and monitor! Drop a reminder to yourself, note down a phone number, make sure you can get to it from anywhere! And use a private folder to jot down the great gift idea you just had for a colleague, friend or spouse instead of leaving the note on your desk to be found! 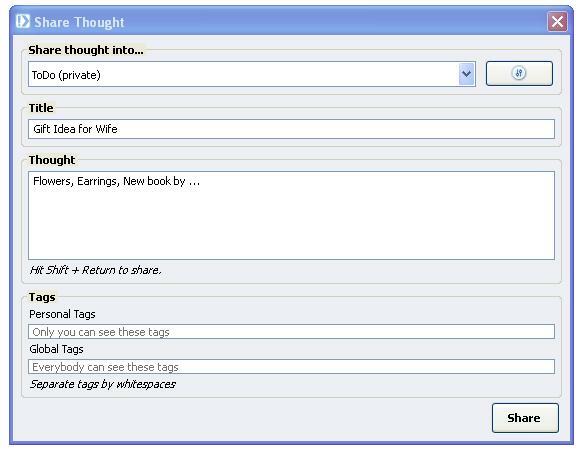 You can find your shared thoughts in your target folder to modify, comment or delete your entry. Another great use case for a ShareOnVibe feature is migrating text easily into Vibe without all the well-known copying and pasting. To add text from documents, wiki websites or online articles to your Vibe wiki folder just use the option Share Selection and choose a wiki as your target folder in Vibe. Every text passage you share is stored as a wiki page in your Vibe wiki folder. The information displayed includes the page title and a link to the original page. Now you only need to rename the entry appropriately and quickly re-link the pages. 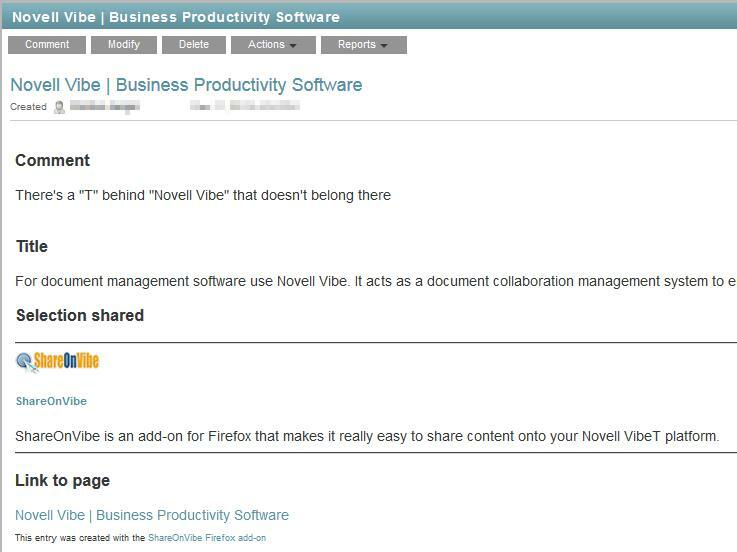 Even migrating text from Word documents or PDFs could not be easier than with ShareOnVibe – upload or share it into Vibe, view the file as html and use ShareOnVibe to share it into your Vibe folder. A not so obvious application of ShareOnVibe is the fast and easy creation of tasks in Vibe. Imagine you are just getting some work done and suddenly the phone rings and your boss gives you a new task, not urgent but to be kept in mind. Instead of losing your focus in the time it takes to write things down on a piece of paper or to navigate to the appropriate place where you normally create a new task, you just right-click in your browser, use Share Thought, and choose a task folder as your target. 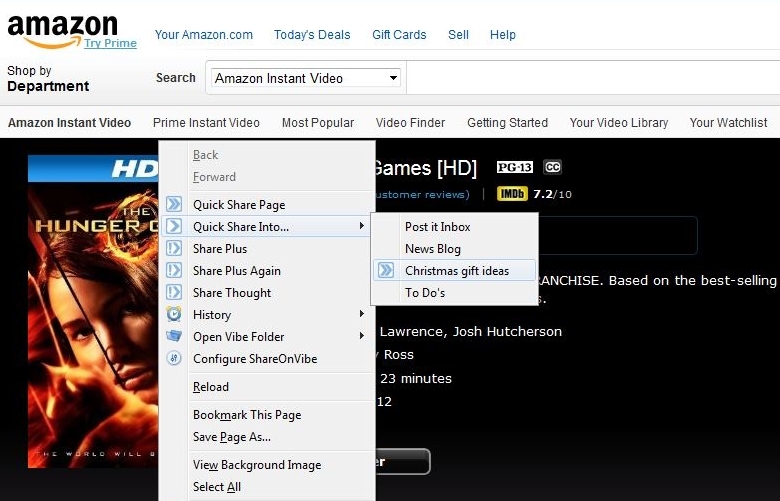 With title and description you can create a new task quickly and easily. Afterwards you can go to your task folder and manage your shared tasks by assigning it to a person, rating it according to priority and adding a due date. With the great functionality of the Vibe task folders, you can even create task hierarchies with ShareOnVibe! You won’t forget the little things again, because as quickly as they come up, they’ll be added to your task list! Getting them off the list is unfortunately something we can’t assist you in ;-). IT security is a big issue for companies nowadays. Having security breaches means running the risk that confidential information reaches your competitor or customer data is leaked or even displayed publicly, causing a scandal. What’s easier than informing all your colleagues about loopholes, zero-day exploits and security updates via ShareOnVibe? You can share the article with the relevant information, or part of it, and through the link in the Vibe blog entry your co-workers will find the update or the original article. Especially if your team set up the E-mail Notification or subscribed to the RSS feed for the Security Blog, it is made sure that the information reaches everybody. At work you sometimes have to research the internet to find the solution to a problem. Instead of just reading and following the instructions given in expert forums and online documentations and having to do the same research again next time (or keeping the solution to yourself), you can create your own knowledge base with information snippets found in the internet. That way you can draw on the saved information at a later time or help your colleagues to solve the same or a similar problem by themselves, e.g. while you’re on vacation. By selecting the relevant text and sharing it into a blog folder with ShareOnVibe, you can easily create your own knowledge base in Vibe, showing all the important information in one blog, with one blogpost for each information snippet. In your target folder, the selected text is displayed together with the title of the website and a link to the website the text originates from. But don’t forget to share the blog with your colleagues – so you can avoid being called on your mobile phone for help during your vacations ;-). Especially before holidays, you do a lot of internet research to make the best out of your vacation. You look for information about your destination at the tourist office website, via Google, or you search specifically for hiking trails, restaurants or jet ski rentals and after a few minutes, you probably lose track of all the opened tabs and accidentally close the one with the interesting information. ShareOnVibe can help you keeping track of all the possibilities for activities and background information on your destination. While surfing, select the relevant text passage or page, right-click and share it into your private folder. In your target folder, the information snippets are displayed as the folder is configured, e.g. as blog posts. If you gathered a lot of information, the amount might be overwhelming, but you can structure your collection by using different private tags like “hotel”, “history”, or “activities”. That way, you can get an overview of the possibilities at a glance, looking only at those posts currently relevant. And the information is available at any time from anywhere – just use the Vibe app on your mobile to find the nice little café at the seaside or the most interesting sights of the city that you have researched in advance. In case you need more information than the shared text snippet offers, simply click on the link displayed in the entry to visit the original website. After you enjoyed your holidays, you can clean up and rate your entries and then share the folder with your colleague or friend who is planning to do the same trip soon, so he can follow in your footsteps while you are already exploring some new places. Your IT-system has been running smoothly for the last years, but lately, more and more employees want to bring their own devices, work at home or while traveling. So your team decided to research new technologies in expert forums and websites, or on magazine homepages. Finding information is easy, but how do you aggregate it? How to make sure everybody gets the information? Wouldn’t it be easier to gather all these articles in one folder, so the whole team knows the state of things? And is there an easier way to fill the designated blog with information than one right click and one left click? Let us show you how fast and easy you can get your newest information into your company’s Vibe site! When you find a relevant article, right click on the page you’re on and select the share option you want to use. Choose your target folder and be done! In your target folder, the pages you shared via ShareOnVibe are displayed with a link to the page, its title, as well as – depending on the share option you selected – comments and tags you added. And if it’s just part of an article you need, select only the relevant passage with your mouse and share it into your target folder – the selected text will be displayed directly in the entry. When you share a big number of pages during your research, we recommend that you tag your entries directly in ShareOnVibe’s “Share Plus”. By using Global Tags for your entries, you can filter your results later so you don’t loose track of your options. Christmas is approaching fast and you have no time to rush through dozens of shops and stores this year? You had some ideas for Christmas presents, but you lost several of them in your browser history before managing to actually buy them? The solution is so simple. Be prepared for online Christmas shopping by saving your gift ideas with ShareOnVibe in a private Vibe folder – secure from the curious eyes of your colleagues, your bosses or loved ones. Just right-click on the product pages while browsing various online stores and Quick Share them into a Vibe folder to which only you have the access rights. Once you’re done collecting your ideas, you can rate them in Vibe and order your favourite gifts online just by working through your folder. No more skimming through all online stores to find them again, you’ve got your list and the link to the product page is included, too. Collect your ideas until December 2nd and then check on Cyber Monday if there’s a special deal! You’re checking something out on your company’s website or blog and you come across some spelling mistakes, outdated information or a non-functioning video? There’s nothing easier than letting the web content mananger know via ShareOnVibe: Use a Vibe folder for your whole team, department or organizational unit that notifies the web content manager with every new entry and add that folder to your ShareOnVibe folders. So when you stumble across one of the aforesaid mistakes, just select the text area with your mouse and right-klick. Quick Share the selection into the designated folder or use the Share Plus option to add a comment (like “Video doesn’t work” or “Link no longer exists”). Once you have shared the text snippet into the folder, the web content manager gets a notification informing him about the new entry. The information displayed in the entry includes not only the text snippet and your comment, but also a link to the site where the mistakes had been made. 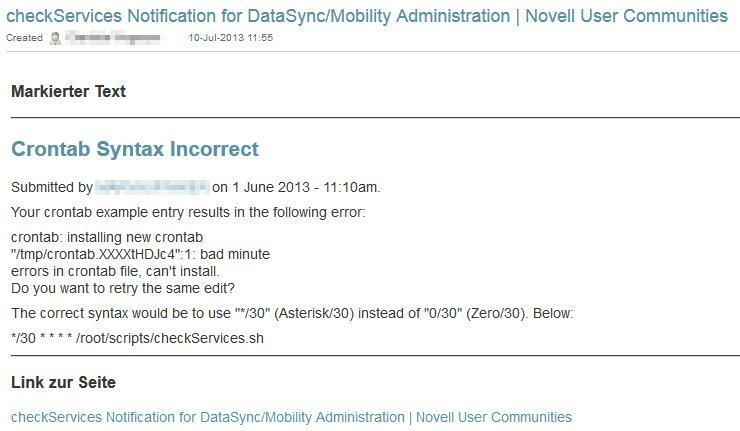 Therefore, the manager doesn’t have to search for the reported errors all over the page, but they are presented to him and the effort needed to correct them is significantly lower. Found a spelling mistake on our website shareonvibe.com? Share it with ShareOnVibe into our target practice folder. Don’t let received calls be forgotten! You probably know the scenario: You’re the first one to come into the office in the morning and the phone rings. You answer the call and the call is for your colleague and concerning one of his projects. You write a quick note on a piece of paper for telling your colleague later, but as it happens, work gets the better of you and you forget telling your colleague about it. In the afternoon, on a short coffee break, your colleague complains about the progress on his project being stalled because he needs some input from someone outside of the department. Suddenly you blush red hot and remember the sticky note about the phone call from the morning … even though it is so easy to prevent situations like these! Had you just thought of using a Vibe folder to drop your info about received calls into… In Vibe, the Micro-Blog folder does very well suit the short message style usually sufficient for such information. So create a new folder accessible to your team, your whole department, or just “the one guy you always have to pick up the calls for”, and you’re ready for the next call. Next time a call for your colleague comes in, right-click anywhere in your browser window and use the Share Thought function. Take down your notes in the Share Thought form – including time of the call, caller, and the addressee of the call, so the recipient knows whom to get back to – and of course the reason for the call. Then share the Thought into the “Calls” folder. The received call will now appear in the “What’s new” Feed and everyone with access to the folder you dropped the information into is thereby informed about the call. There is no risk of forgetting to communicate calls and you can look it up anytime. Try to agree with your department on a structure for the call notes. This way, everybody can see in a glance whether the information is for him – and the work process is made more comfortable for everyone. Please be aware that the way the shared information is represented inside Vibe depends on the type of the target folder you choose. In a blog folder, the new entry will be a new blog post, while sharing into a discussion folder makes the entry a discussion post. The text, image, file etc. will be shared together with information about its source such as page title, description and a link to the original website.